With the success of “Close To You” and “We’ve Only Just Begun” our schedule was not quite as relaxed as it had previously been and I did not have as much time to write or listen to material. Thankfully, I lucked into several very strong songs. “For All We Know” - Karen and I were in Toronto in November, 1970 to open the show for Engelbert Humperdinck. We had one night off before opening and our manager Sherwin Bash suggested we see the film “Lovers And Other Strangers”. We enjoyed the film and noticed the song “For All We Know”, which we recorded upon our return home. It went gold, peaking at No.3 and subsequently won an Oscar for Best Song of 1970. The bass work of veteran studio musician Joe Osborn on this track should be commented upon, not only for his effortless fluidity in performing the descending bass line, but the subtle syncopations he inserts helping to make this recording as strong as it is. “Rainy Days And Mondays” - Nichols and Williams sent a demo of this song to us. Two listenings and I decided it was perfect for Karen and me. 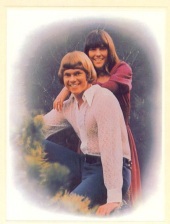 This recording remains a favorite of many Carpenters’ fans. Not only is it a strong piece of writing, but I purposefully kept the arrangement rather sparse in order to showcase Karen’s remarkable reading of the song. Keep in mind that Karen was a few weeks shy of turning 21 when she cut this lead, a performance that sounds way beyond her years. Though I never thought that “Rainy Days and Mondays” ever got her “down”, Karen did state in an early interview that whenever she sang it she “slipped into a different world”. “Superstar” - Karen and I came home from the studio relatively early one evening in early ’71. She went to bed, but I tuned in “The Tonight Show”. The host, Johnny Carson, was championing a then relatively unknown performer named Bette Midler. One of the songs she sang was “Superstar”. It was quite a bit different than what my arrangement turned out to be, but I knew it could be a hit. As the lyric never mentions the word “Superstar”, I had to quiz a few people about it to find out its name in order to get a lead sheet or recording. It turned out that Leon Russell and Bonnie Bramlett had written it for Rita Coolidge and the Joe Cocker “Mad Dogs and Englishmen” recording and tour. The album was on A&M and I owned a copy of it, but never got around to playing it. I opened the album, familiarized myself with the piece and constructed my arrangement; a perfect song for Karen and the “Carpenters’ sound”. Another favorite of Carpenters’ buffs and certainly of mine. Once again, Joe Osborn’s imaginative fills in the intros add an extra element of effect to the recording and Hal Blaine’s drumming in the “hooks” demonstrates why he was the top studio drummer in town. 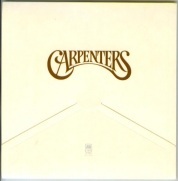 The “Carpenters” album also features “Hideaway”, a beautiful song by Randy Sparks, who is best known for his group “The New Christy Minstrels” and another of his songs, “Today”. Before Karen and I started out on our own, we were in the aforementioned group “Spectrum”. Randy hired us (a very rare booking) to perform at his club Ledbetters. He opened the show and “Hideaway” was one of the songs he sang. I liked it immediately and never forgot it. “One Love” is a song John and I wrote in 1967 while we were employed at Disneyland as the piano/banjo act at “Coke Corner”. Originally called “Candy”, it was written for a waitress of the same name in “Coke Corner”, who caught all four of our eyes. The album closes with “Sometimes”, a touching Felice Mancini lyric written for her parents and set to music by her father, Henry. The aforementioned Bacharach/David medley is also included, but not in its original form, which had additional songs, as well as longer versions of some that remained, and ran almost fifteen minutes. In early 1970 we were asked to guest on several nationally syndicated T.V. shows (Della Reese, Virginia Graham et al.) They wanted the medley, but not longer than five or six minutes. This involved heavy editing as well as speeding up the remaining tunes. A year later, running out of time to record, I decided to include the shortened medley in the album. For the rhythm track, instead of studio musicians, I used Karen and our group who, after having performed it countless times on stage, got it in one take. Karen and I then did all the vocals, which sound terrific and no doubt contributed to our winning a Grammy for “Outstanding Performance by a Duo, Group or Chorus” for this album. My regret is that we didn’t, I guess couldn’t, take the time and record the entire medley at the proper tempos, along with an orchestration I had fashioned. What’s on the album is very polished, but just too fast. Album Concept and Design by Craig Braun Inc.